In my progress report for October, I discussed efforts to repair issues with the paint and application of a sealer coat. I had hoped to be able to report that painting was complete by the end of November but unfortunately that is not the case. Once the sealer was applied, I carefully went over the entire car with first 400 grit and then 600 grit sandpaper. As the sanded finish is blown off with compressed air and then wiped down with “Final Clean”, many very small remaining issues with the paint finish are revealed. To have a perfect paint job, the color coat must be applied over a perfect primer surface. Any defects in the primer are telegraphed by the color coat. One issue are small pinholes. These are typically filled with the red spot putty. Another typical issue is the “feather edging” of areas where body filler was applied. This edge will show up if it is not perfect. 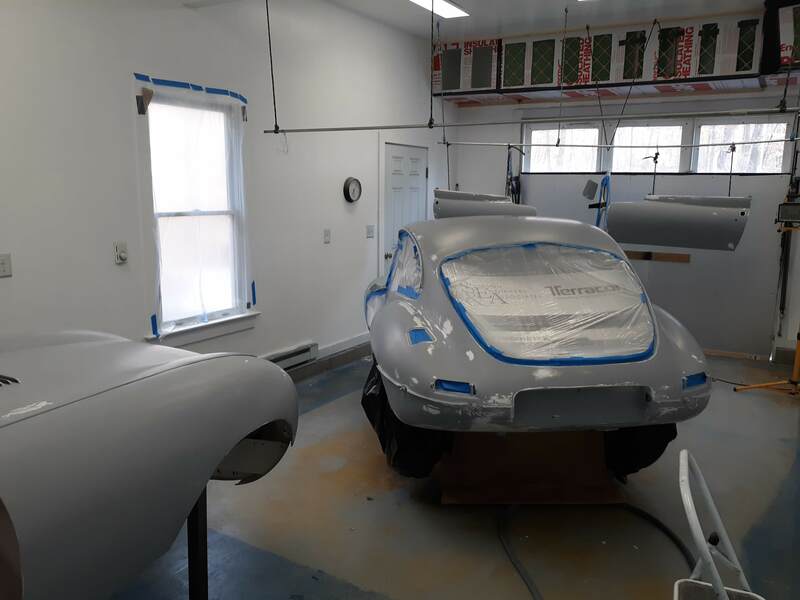 Also, all secondary areas such as the door jambs and surfaces where rubber gaskets will ultimately reside must be hand sanded so they will accept paint. Finally, the masking that applied for the initial primer/sealer coats must be re-established. In most cases, I cover the existing masking with thin painters plastic resealed around the edges with blue painters tape. This is to ensure that a very clean debris free surface exists next to the areas to be painted. I have kept a rough log of my man hours. My estimate for getting the paint job to the point of being able to spray color and clear is over 80 hours! That is one reason that good quality paint jobs cost so much. Right at the end of November, I applied my first color and clear coats. Unfortunately, after a close inspection, I still have a lot of work to do, as there were a number of blemishes in the paint job that will require correction. With luck, this will involve fine sanding and compounding. If necessary, application of additional paint may be required. The entire month of November was not just about paint. I also placed a major parts order with SNG Barratt, shipped items off for chrome plating, and shipped items out for zinc plating. These 3 actions are related to some degree. I have found that the cost to get an item chrome plated can often exceed the cost of buying a new reproduction item. There are several considerations here. First and most obvious, if a part is not available as a reproduction, then the only choice is to get it rechromed. Also, there may be cases where the reproduction item may not meet my quality or fitment standards. In general, heavy items like bumpers are better candidates for rechroming. 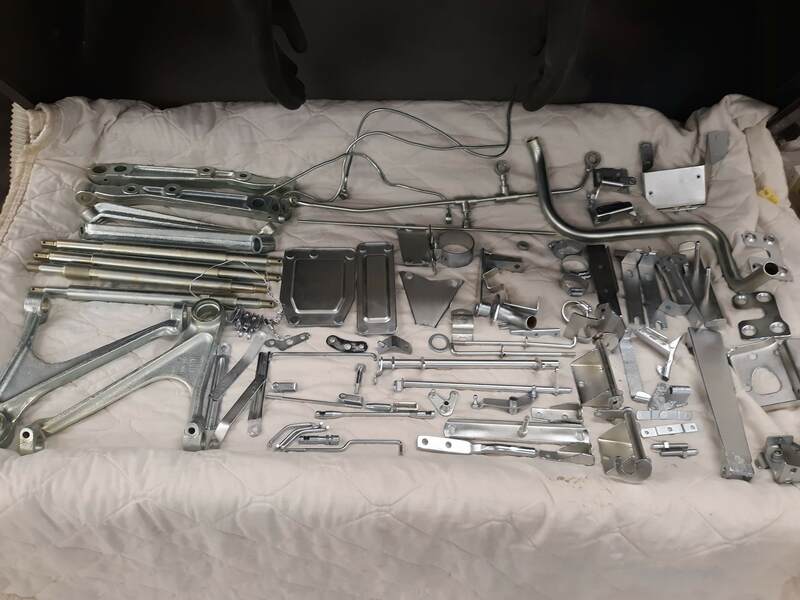 Part of this is due to the fact that the chrome plating process involves the application of 3 separate materials (nickel, copper, chrome plate) with buffing in between. Having done it myself, buffing a thin trim part is hard and subject to the part being caught, bent, mangled, and flung across the room. 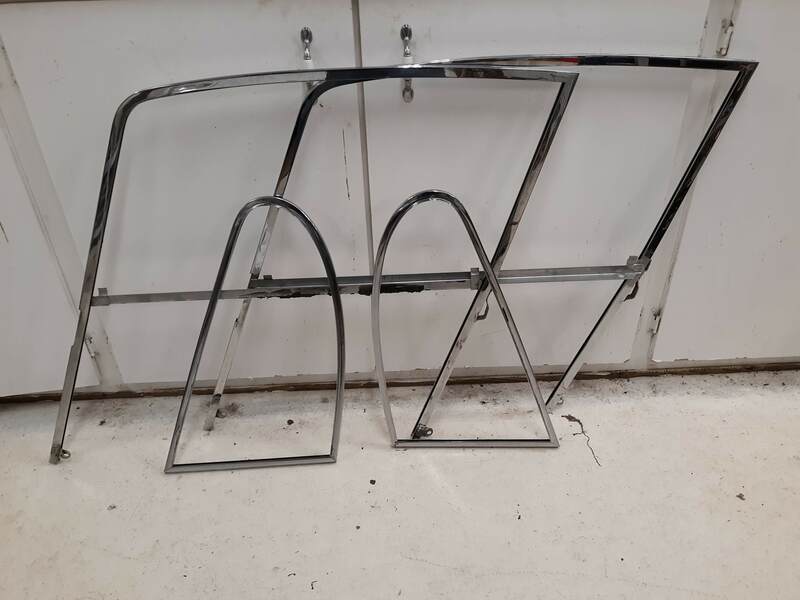 So for thin parts like the chrome accent strips that run down the hood or around the windshield, it is easier and more cost effective to take the new part directly from initial manufacture right to a chrome plating line, where little or no hand buffing may be required. During my initial restoration, I used Pauls Chrome. I went with them again this time. 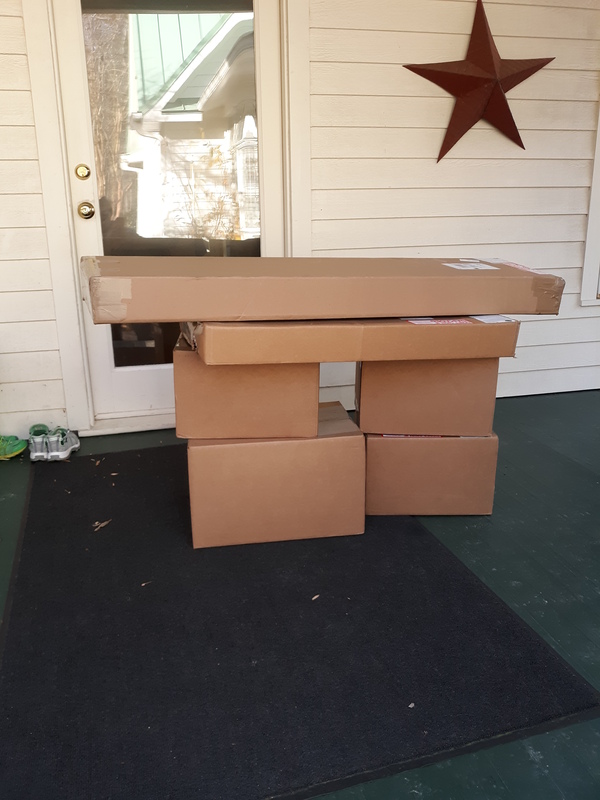 After much review considering the above factors, I sent them the pieces that surround the door windows, the pop out windows, the B pillar, and the door handles. 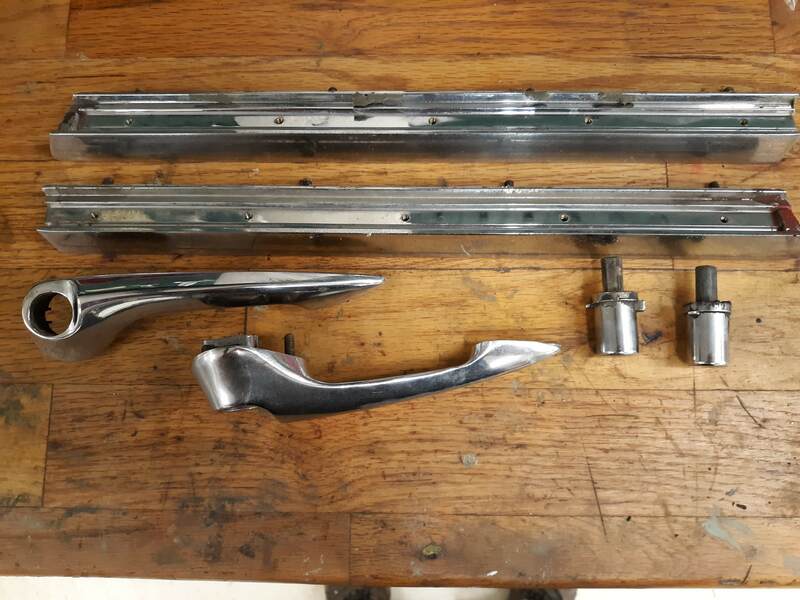 These few items will cost $2500 to be chrome plated. They quote an 8 week lead time so this is something that shouldn’t be put off to the last minute. There are a number of items, most in the engine compartment, that were originally plated with cadmium. Indeed, if you search the JCNA judging guide for Series One Etypes for the search term “cadmium” you will obtain a very good feel for which parts are involved. Unfortunately, cadmium has been identified as a cancer causing agent and it is thus hard (but not impossible) to obtain cadmium plating services. I decided to go with zinc plating finished with a clear phosphate coating. This service is much more readily available. I went with Industrial Electroplating in Gastonia, NC. Zinc/phosphate plating is a batch process. Large parts are hung from hooks as they move from station to station. Small parts are put in a mesh basket. The result is that I submitted over 90 parts and paid the bargain fee of $150. Turnaround time was about a week. I dealt with Terry Brooks. He and his crew provided outstanding service and results. I would note that I spent a lot of man hours with the bead blast cabinet getting all the parts cleaned up to bare metal. This has to be the best bang for the buck in the restoration hobby! Finally, there was my order to SNG Barratt. I tried to identify everything I would need. First, the more items I ordered, the better the discount. Also, some items I needed are on backorder. SNG advised it was best to get in line so when items did become available, I would have priority. Many of the items I ordered involved originality issues in the engine compartment. Examples were the alternator, the battery, the voltage regulator, exhaust manifolds, and spark plug leads. I also ordered a number of items that, as discussed above, replaced existing chrome trim with new items. The parts order was around $3000. I’m not done yet but that should get me close. I dealt with Tony Lee, the office manager, who was quite knowledgeable and helpful. So there you have it. A busy and productive month. Unfortunately, things will probably slow down over the holidays but we’ll see. My goal now is perfect paint by Christmas!